The National World War II Museum in New Orleans is a place I had wanted to visit for several years. On our earlier trips to the Big Easy, we simply didn’t have enough time to explore this museum complex that covers six acres in the Central Business District of New Orleans. Finally, my son and I found time to visit and we were overwhelmed by the expansive number of exhibits inside. 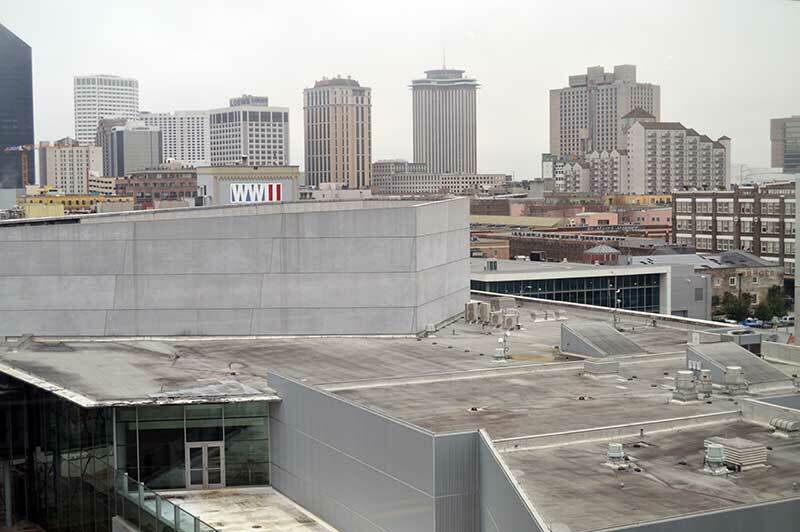 The National World War II Museum featured in our guide to New Orleans beyond Mardi Gras. If you’re looking for a place to stay, here are some hotels near the National World War II Museum. All photos by Clayton Hensley unless otherwise noted or watermarked. You can see more of Clayton’s photos and writings at @KnoxDaytripper. 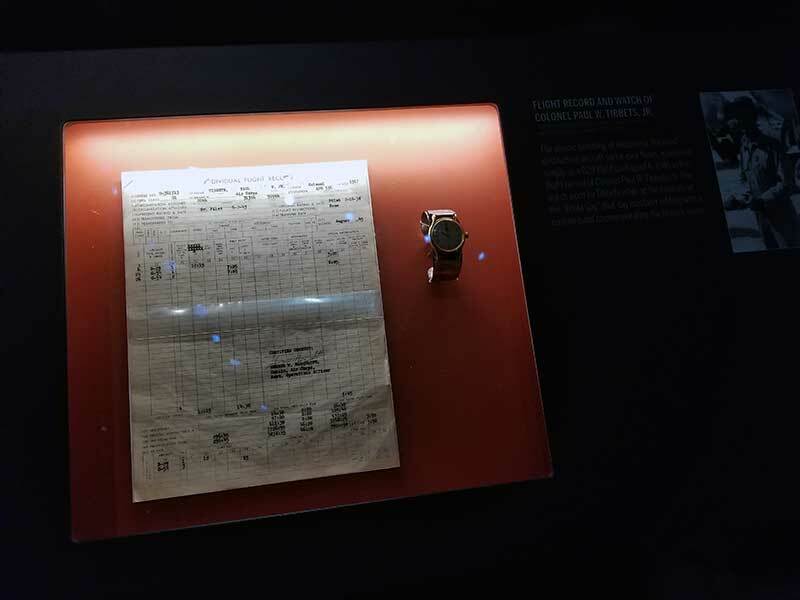 At first glance, an individual flight record on display at the National World War II Museum seems insignificant. Typed on the government document are dates and times of flights taken by Colonel Paul Tibbets in August of 1945. It would be easy to overlook this important piece of paper and move on to the larger more eye-catching photos and artifacts in the room. Upon closer examination, you see the date August 6 and realize just how significant the flight on that day really was. Colonel Tibbets and his crew aboard the Enola Gay changed the course of the war and history, dropping an atomic bomb on Hiroshima in Japan. I live just a few miles from Oak Ridge, Tennessee. In case you don’t know, that place was an integral piece of the Manhattan Project, which ushered in the atomic age and helped enrich uranium for the nation’s atomic weapons program during World War II. For me, seeing such a simple piece of paper recording something so extraordinary seemed odd. However, it was understandable given the gravity of the payload aboard that August 6 flight. We’ve visited the Peace Memorial Museum in Hiroshima, which commemorates that fateful day when the Enola Gay dropped an atomic bomb on the city. Cynthia C. Kelly’s book about the Manhattan Project provides first-person writings from the bomb’s original creators. Just walking in to get our tickets, we were immediately taken back to our time a few summers ago at the National Air and Space Museum in Washington, DC. Over near the window sits a “Higgins boat”, used during the D-Day invasion, one built by a New Orleans company. Hanging from the ceiling are a couple of World War II-era planes and large maps showing the scope of the war. At the back of the room is a train platform, train schedule and a Union Pacific rail car. While you don’t have to start your journey through the museum there, I highly recommend it. 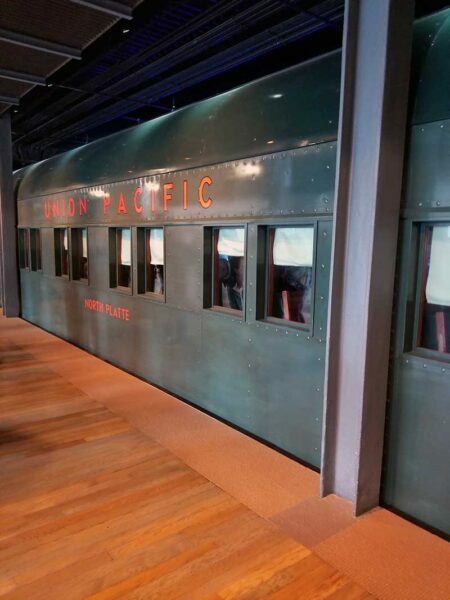 Inside the rail car, you choose someone to “follow” throughout the museum. Each person’s story is told during various parts of the museum. I followed the story of a Red Cross volunteer a perspective I knew little about. 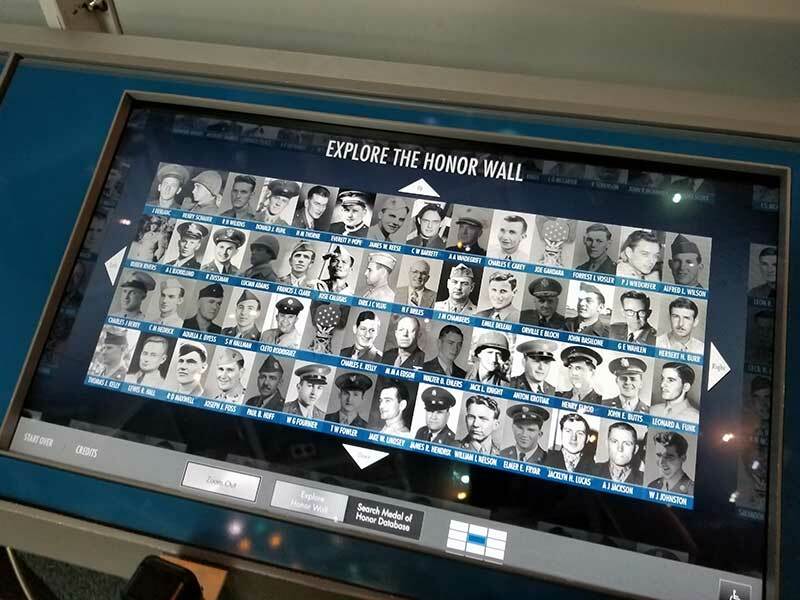 Your assigned “dog tag” card also allows you to learn more about the person long after your visit. On this visit, we chose to follow “The Road to Berlin” first. At first, it’s easy to get overwhelmed by all the video presentations, collections of artifacts and wealth of information. However, you can take a lot in whether you have just an hour or the whole day. One of the first things that stood out was a “bombed” out metal building where you could look out and see planes flying above. Hanging on the walls were the front pages of newspapers talking about the allied invasion of France. The most powerful part of the Road to Berlin came toward the end. 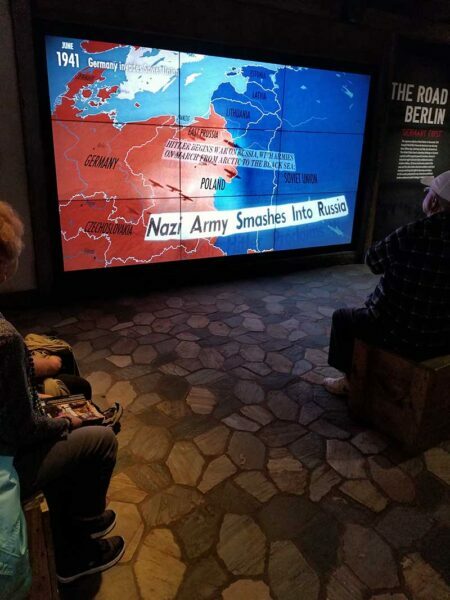 The exhibits detailing what happened after Germany’s surrender were incredibly moving. I knew about the scope of the destruction, but the film clips and stories in the exhibit intensified things. It became a much more powerful story of the unintended costs of World War II. “The Road to Tokyo” also carries a great deal of emotional weight. The journey begins with the attack on Pearl Harbor and the American determination to avenge the attack. Stepping down the hall, you step onto the bridge of the USS Enterprise (the WWII era one, not the one from Star Trek) where you can see enemy fighters through the large windows. The Pacific War charted a very different course for the American military than what was happening in Europe. Each exhibit on the Road to Tokyo illustrates the many challenges the Allied forces encountered. That included dealing with the weather and insects in the tropics to the unrelenting will of the Japanese fighters. Like the Road to Berlin, the end of the exhibit brings to light some often-untold stories of the desperation felt during the final days before the Japanese surrounded. One of the most pleasing parts of any museum is seeing just what curators can fit into space. 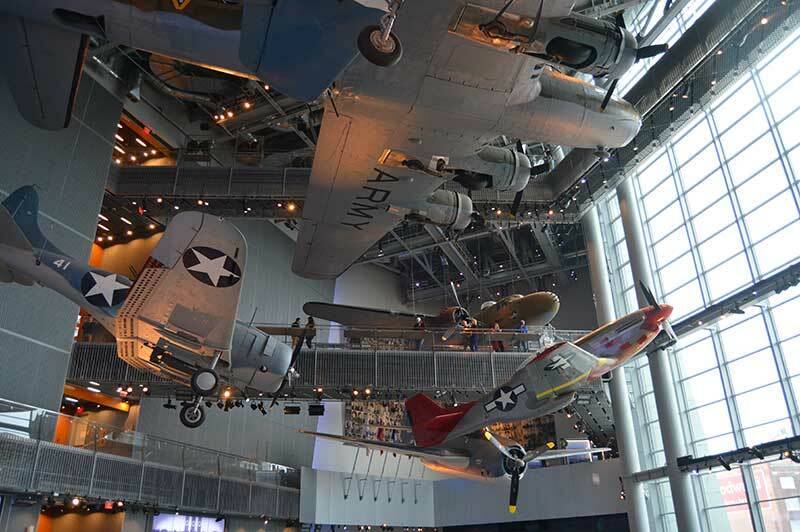 Nowhere is that more evident than the US Freedom Pavilion of the National WWII Museum. If you like big warplanes, then this is THE place to be. You can certainly admire them from the ground level. Going up a few stories is where to get your best views. However, if you’re afraid of heights it is highly recommended not to go beyond the second floor and there are multiple signs reminding you of that very fact. The walkways through the large atrium space allow you to glance down on the planes and space below. The windows to the outside bring into view the Big Easy itself. This hall is also home to incredible interactive exhibits and a theater. 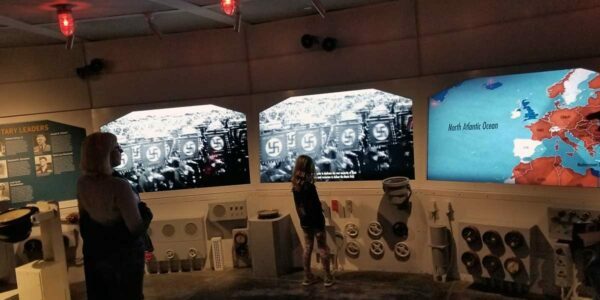 In a city known for its laid-back atmosphere and for throwing parties for just about any occasion, the presence of the National World War II Museum probably seems out of place. At times it appears to be too somber. However, the museum’s stunning architecture, stories of heroism and sacrifice and those big planes hanging from the ceiling actually seem to be a good fit for the city. After all, the resilience of New Orleans in the wake of disaster is one of its hallmarks and given the city’s role in the war effort, it’s certainly something you should put on your list when you’re visiting the city, but be sure and plan to spend at least three or four hours there. And if you’re there on the day before Mardi Gras, do like we did and go to the museum in the morning, then take a walk Uptown to catch a few parades that night. Traveling has been a part of my life as long as I can remember. I am blessed to live in one of the most beautiful parts of the country, the Appalachian Mountains. I am an East Tennessee Native who has also lived in Southwest Virginia and the Music City, Nashville, TN. Wherever I roam, I make sure to find interesting things to see along the way, whether that's traveling to a small and almost forgotten town or a big city filled with places to explore. It’s very interesting and crazy to think that it happened less than 100 years ago. Thanks for stopping by!